Utah is more than just Jell-O and funeral potatoes. It’s also the state with the highest birth rate, proven by statistics and demonstrated by an enormous range of family-friendly attractions. There are the basics: a zoo, a planetarium, a children’s museum, an aquarium, a pioneer village and a natural history museum all beg for your attention. What else do you want? National parks? Check! Amazing state parks? Double check! The challenge is that there are so many obvious attractions that it’s easy to miss the less obvious, but way more brag-worthy, destinations. Whether you are a native or just in town for a few days, consider these off-the-beaten-path day trips from Salt Lake City when you are planning your next adventure. You won’t regret it. Don’t tell him they’re other people’s broken pieces. He’s thrilled! At first glance, a patch of rocky land way out in the West Desert, about two hours or so from Salt Lake City, may not seem like the best place to take kids. But if you have the type of kids that enjoy hitting things with hammers, treasure hunting, and screaming at the top of their lungs (which I do), Topaz Mountain is a dream come true. So named for the copious amounts of topaz and other minerals hidden in its rocks, this is an area of public land managed by the Bureau of Land Management. The very top of Topaz Mountain is now under lease to a private company, Topaz Mountain Adventures, but the surrounding area is still open to public rock hounding. If you prefer guided adventures with a greater guarantee of coming away with topaz or another semi-precious stone, go with the private company. They have blasting tours, and you are far more likely to find larger treasures in freshly blasted rock than if you go it alone. If you’re like us and way too cheap for that, you can view the map of the area on Topaz Mountain Adventures in order to avoid trespassing, and proceed to the public land. You are allowed to rock hound the public areas with hand tools only (so leave that stick of dynamite at home). You’ll need hammers, screwdrivers, bags/boxes to bring stuff home in, hats, sunscreen, and lots and lots of water. There is nothing out there: no water, gas, bathrooms. But for the price of a tank of gas, you can drive your family out there and let your kids go wild. We took my six-year-old and had a grand time, despite collecting only the tiniest of crystals. We had plenty of fun cracking rocks open with the hammer and running up and down hills. The six-year-old found small pieces of what were almost definitely originally beer bottles leftover from previous rock hounders, and that was good enough for him! To get to Topaz Mountain from Salt Lake City, take I-15 south to Nephi, fill up your gas tank, then head southwest for another hour or so. It’s marked on topographic maps and easily found on Google maps. Utah Outdoor Activities has a good summary of the area and how to get there as well. If you are so inclined, you can camp on the public land around Topaz Mountain. There’s plenty of wide-open spaces in which you could park an RV or pitch a tent, but no services at all. You will be on dirt roads at the end of the trip, but you don’t need four-wheel drive. Bring water! Bring sunscreen. And water. And hats. Fossils = dinosaurs, right? Well, they did my my son’s head, at least until we had a little science lesson. Don’t make the mistake I did and lead your kids to believe that they will be digging up dinosaur bones; that’s a recipe for tears. But with the proper mental preparation (and physical preparation, as this is another activity that requires lots of water and sunscreen), the opportunity to find your very own fossils makes for a pretty unique family day trip. There are multiple places to do this within two hours or so from Salt Lake City. One is U-Dig Fossils outside of Delta, Utah. This is pretty close to Topaz Mountain and you could do both in one long day, if you’re so inclined. At U-Dig, the fossils are trilobites, a form of invertebrate marine life. My family is more impressed by fossils that look more like modern fish, so we headed to Kemmerer, Wyoming, two hours from Salt Lake City. Ok. Yes. This is technically in Wyoming, not Utah. Just roll with it. Southwest Wyoming is within the Green River Formation, an Eocene period geologic formation where conditions were just right to preserve a wide variety of fossils about 50 million years ago. 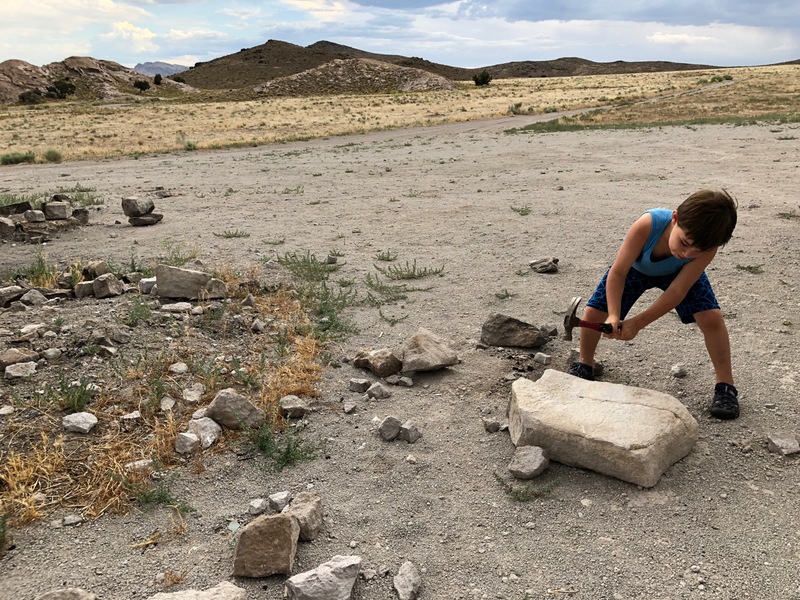 There are multiple private quarries where you can pay by the hour or day, pick up a hammer, and find your own fossils; these include American Fossil and Fossil Safari. We ended up at American Fossil, where the staff were very good at showing first-timers how to split the rock, identify the fossils, and saw the pieces into frameable souvenirs. The fossils are found in limestone shale. 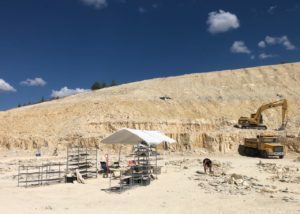 Blocks of rock are removed from the quarry, and all you have to do is split the rock with a hammer and chisel into sheets until you uncover the fossils you want. 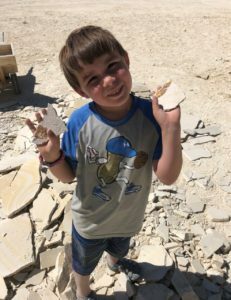 People often discard broken fossils, and our six-year-old had a great time just “finding” fossils all over the ground while my husband played archeologist. In less than two hours, we had box full of fish fossils. Admittedly, some were my child’s broken treasures, but some were certainly display-worthy! While you’re in the area, visit Fossil Butte National Monument, which is nine miles west of Kemmerer. The visitor’s center there hosts an amazing array of fossils and information about the Green River Formation. Make sure to ask about their Junior Ranger Program. It was very educational, and kept the kids busy exploring every part of the visitor’s center and their collection of fossils. As a bonus, the patch they earned was awesome! I may have stolen it for myself. To get to Kemmerer, Wyoming take I-80 East from Salt Lake City. Get off at Exit 18, which will put you on Highway 189 to Kemmerer. Fossil Butte National Monument is nine miles west of Kemmerer on Highway 30. To get to American Fossil, which is just north and east of Kemmerer, follow the directions on their website. For this trip, you will also be on dirt roads at the end of your journey, but the trip is manageable in a sedan. Given the severity of Wyoming winters, it’s no surprise that the quarries are only open from about Memorial Day through September. The Spiral Jetty is a unique way to experience the Great Salt Lake. The Spiral Jetty is one of the great pieces of American land art. 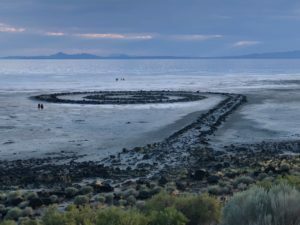 It’s an earthwork sculpture made entirely out of mud, salt crystals, basalt rocks and water, built in 1970 by artist Robert Smithson, jutting out over the Great Salt Lake. If you are visiting Utah, a trip to the Great Salt Lake is in order, and this is as good a place as any to dip your toes in, when the water levels are right. The sculpture can be visible or submerged, depending on the water levels of the lake. During our visit this year, the lake levels were low. Not only was the Spiral Jetty completely visible, we had to walk a bit to reach the water. For an ethereal experience, go at sunset. Pastel pinks and blues will surround you in the water and sky, offset by the crunchy white salt you must traverse to get to the lake. Warning: you know how walking on crusty salt crystals really tears up your feet? You don’t? Well, you will. This isn’t a powder soft beach. Put your kids in water sandals or you’ll end up carrying them them whole time. This is one trip that requires some preparation. It takes about two and a half hours to reach the Spiral Jetty from Salt Lake City; the nearest town is Corinne, forty miles away. There are no services anywhere around the Spiral Jetty, including bathrooms or water. Make sure you have a full tank of gas, food, water, sunscreen, towels, and bathing suits. Consider bringing jugs and jugs and more jugs of fresh water. If you swim in the Great Salt Lake (which you should: the high floating feeling is something special for everyone, and the kids will get a kick out of seeing how everything floats) you will emerge encrusted in salt. This is uncomfortable for adults, but intolerable for some kids. For the best photos, hike up the hill above the Spiral Jetty. But don’t let your kids hike up there alone…I did see a rattlesnake on the trail. To get there: Take Exit 365 off of I-15 north from Salt Lake City. Turn right onto Route 13 toward Corinne. Continue west for 18 miles. Route 13 becomes Highway 83. Follow signs to the Golden Spike National Historic Site Visitor Center. Turn left onto Golden Spike Road and continue to the Golden Spike National Historic Site Visitor Center (this is worth a visit on its own, but also has the nearest bathrooms, so don’t miss it). Then drive 5.6 miles west on the main gravel road (N Golden Spike Loop). At the fork in the road, continue left (west). There are signs marking the way to Spiral Jetty. Drive 1.4 miles then turn right at the fork in the road. Continue 9 miles farther until the road ends at the Spiral Jetty. Utah Olympic Park is surprisingly fun! Go to Park City, they said. It’ll be fun, they said. 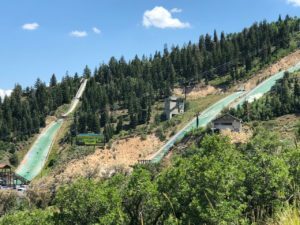 Park City is a mere half hour from Salt Lake City, and it’s a skier’s paradise in the winter and not too shabby in the summer, either. With a cute main street that features more expensive art galleries than you can count, it’s fun to visit but not my absolute favorite place to take the little monsters. Or it wasn’t, until I discovered Utah Olympic Park. Built for the 2002 Winter Olympics, the Utah Olympic Park is an official U.S. Olympic Committee training site and part of a network of sites that were originally built for the Olympics and now host popular winter sport activities for newbies as well as professionals. But this spot on the edge of Park City, in particular, is a great place to take kids in the summer. There is not one, but two free museums inside the main building, where you can explore Olympic history as well as pose for pictures in a bobsled. If you’re feeling cheap, for free you can also hike trails around the area, visit the Discovery Zone playground, and — our favorite — see if anybody is skiing off the training jumps into the pool. Athletes come from all over the world to train here; you can just hope to catch sight of some on the day you are visiting, or you can plan to catch one of the Flying Ace All-Stars Freestyle Shows that are hosted on select Saturdays and Sundays throughout the summer. So yes, take the kids to Park City. And then head to the outskirts of town to the Utah Olympic Park.